On 23-27 March 2014, six representatives from the global fisher movements, the WFFP and WFF, supported by ICSF and a couple of researchers, participated in the UserRights2015 Conference in Siem Reap, Cambodia. Few in numbers, these delegates represent millions of people from indigenous and small-scale fishing communities. The additional 130 participants were from government, inter-governmental organisations, academia, big business, and international conservation organisations. During the five days, it became clear that the dominant, hegemonic view brought to the fore by most speakers and delegates centred around ‘private property’ as a fundamental basis for user rights in fisheries. In fisheries governance this is also referred to as Rights Based Fishing, ITQs, Wealth Based Fishing or Catch Shares by various different players. There is an irony in this almost fundamentalist belief in private property. On the one hand the FAO – the key host of the conference – and the World Bank aims at eliminating huger and reducing rural poverty. On the other hand, the World Bank – as one of the most powerful players in fisheries governance globally – admitted that the private property system is good for some and bad for many. If the very system aggressively promoted by the World Bank – and many other participants at the UserRights conference – is bad for many, how then can it contribute to eliminating hunger and reducing poverty? For more examples on the devastating consequences of private property systems in fisheries – or Rights Based Fishing – see the Global Ocean Grab: A Primer. 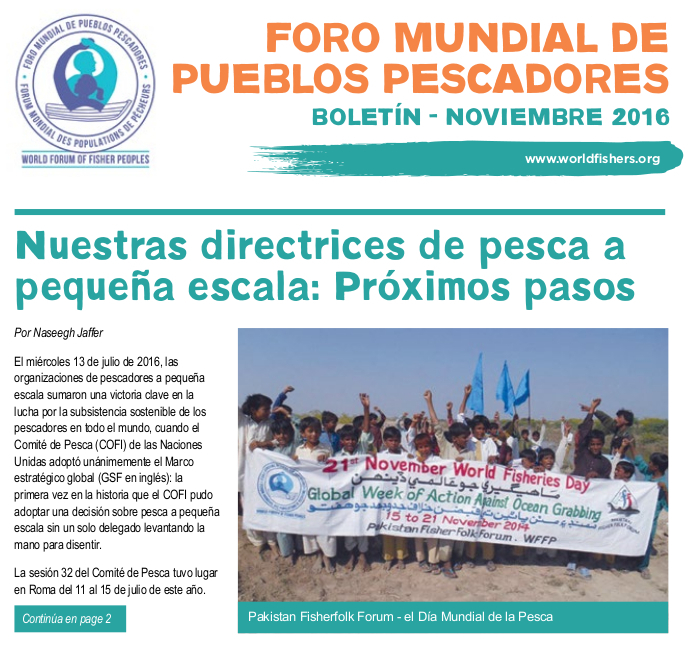 The WFFP delegates repeatedly argued – from the floor, as panellists and in presentations – that small-scale fisheries must be governed by applying a Human Rights Based approach. 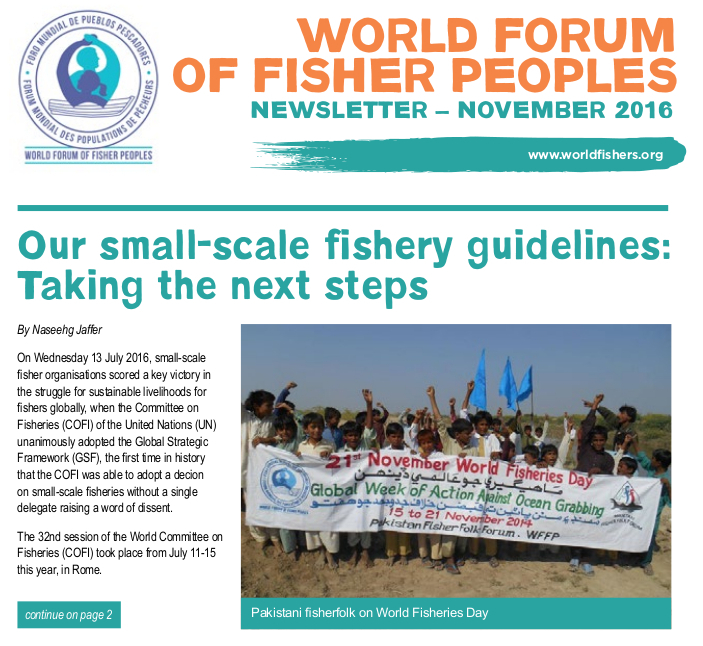 The underpinning principles of such an approach include equality, indigenous peoples rights, food sovereignty, gender equity, poverty alleviation for all, customary and traditional rights, traditional low-impact fishing, and participation in governance. Yet, these arguments only gave rise to a minimal dialogue, and on numerous occasions the responses were degrading and unwarranted. The form of the conference allowed for many short and long presentations but limited scope for real engagement and dialogue. As such, it took the shape of an ideological battleground, where the strongest voice may end up being the one that finds its way into a conference report. Considering that proponents of private property were stronger in numbers and were allocated the majority of slots – air time – at the conference, it is feared that the views of the WFFP will become oppressed in the outcomes of the conference. While we do not know what to expect in terms of concrete outcomes, it is speculated that the conference will produce a report that will be used by the FAO with respect to its future work on fisheries governance, including the International Guidelines on the responsible Governance of tenure of land, fisheries and forests (Tenure Guidelines) and the International Guidelines for Securing Sustainable Small-Scale Fisheries (SSF Guidelines). Considering that the FAO recently endorsed the SSF Guidelines (2014) and the Tenure Guidelines (2012), it was expected that the FAO would use the guidelines to set the scene and inform the contents of the programme. Yet, aside from a couple of references on the official conference website and the mentioning of the guidelines in an opening speech, it was only the WFFP, WFF and ICSF who consistently made use of the guidelines to inform presentations and dialogue. 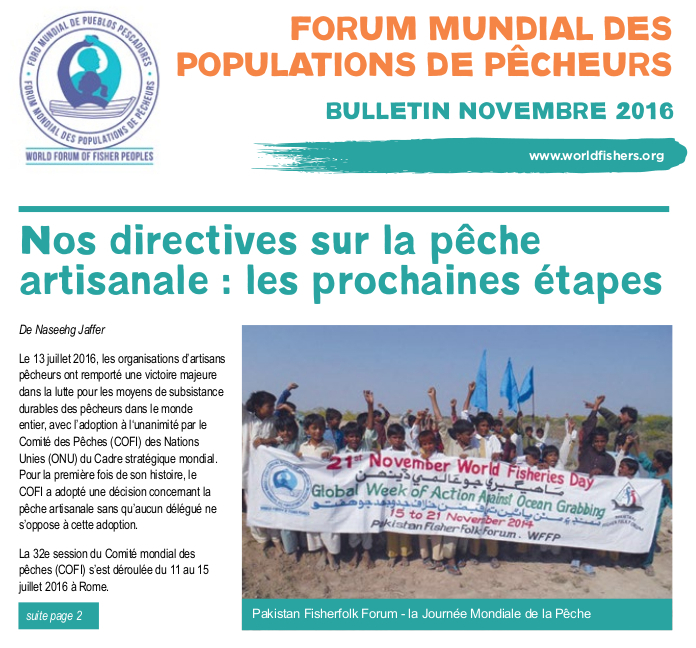 Many participants seemed unaware of the guidelines – or outright ignored their existence – and the FAO officials showed disappointingly little interest in picking up on the linkages between the main theme of the conference – ‘user rights’ – and the Tenure and SSF Guidelines. Considering that the FAO has invested huge amounts of human and financial resources in the development of the guidelines, this almost ignorant position is even more controversial. While many of the ‘usual suspects’ spoke openly about the need for private property, ITQs and similar terms in relation to fisheries governance, some adapted their language and thereby masked their underlying belief in private property as the one and only solution. This adaptation of language is used to strategically persuade others – including fisher movements across the world – about their ‘honest’ and ‘sincere’ support. This happened in Siem Reap, and indeed, happens more generally. At face value, it can be difficult to distinguish the good from the bad, but by looking just a bit deeper it’s not that difficult at all. One approach is to look where the funding comes from, and another is to do a bit of research on the political positions of the various actors and to find out who is serving on their boards. Too often, and in particular with international conservation organisations, we see a very close tie with multinational agri-businesses, super-market chains or other financial giants, and some are even governed by top-business people from the same funding corporations. In the light of the above, it should come as no surprise that the overall impression of the WFFP is that the conference failed in ‘providing guidance’ – which was the only concrete objective of the conference mentioned on the website. Yet, participation in the conference was crucial for a couple of reasons. Firstly, without the interventions of the WFFP, friends from WFF, ICSF and a couple of researchers, the conference would have been an assembly of neo-liberal thinkers and institutions who would have had an unhindered opportunity to develop their own plans for fisheries governance on the basis of private property regimes. Secondly, the knowledge and information about some of the key actors and their agendas, which we have gained by participating in the conference, is critical for developing and refining strategies on how to push for a Human Rights Based approach and the implementation of the FAO Guidelines.